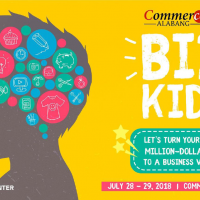 Coming from the success of the first event in 2018, premier lifestyle hub Commercenter Alabang is bringing back BIZ KIDS, a first-of-its-kind fair in the south that gives budding young entrepreneurs a platform to market their self-made products. This year’s event is slated on May 18-19, 2019, at the mall’s ground floor activity area. Exclusive to business-minded kids aged 5 to 12, BIZ KIDS aims to encourage, enable, and empower the next generation of Filipino entrepreneurs by letting them showcase and sell products they made themselves — from food items like desserts and snacks, to handicrafts and arts, and even personal care stuff. At the end of the two-day event, the most promising young entrepreneurs and mini-ventures will be recognized at the BIZ KIDS AWARDS. - Sales Genius, which will honour each of the highest-selling mini-ventures for the categories of Food: Desserts, Food: Snacks, Handicrafts, and Arts. Registration to BIZ KIDS is open with limited slots available. Biz ventures may be registered under an individual, partners, or groups of three, granted that all entrepreneurs are aged 5 to 12. And to ensure that no two participants are selling the same products, applications will be screened. To register, young entrepreneurs must submit the following requirements via email to Bea Malacaman at bea.malacaman@stratmindsevents.com: (1) completed registration form, available for download on: tinyurl.com/bizkids2, (2) photo/s of the applicant/s, (3) business logo, if available, and (4) product photos. Shortlisted applicants will be notified via email and SMS, and the final list of selected participants will be announced on Commercenter’s Facebook page (www.facebook.com/commercenter) on April 30, 2019. 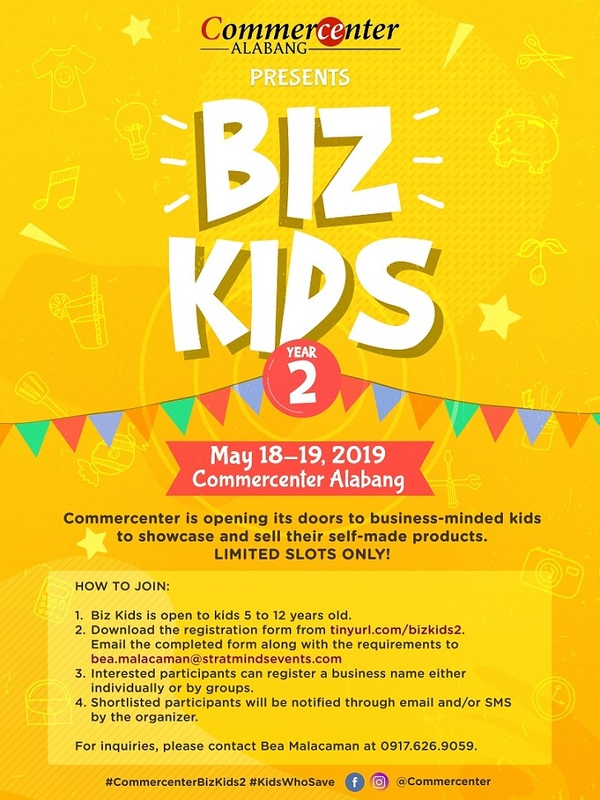 BIZ KIDS 2019 is presented by Commercenter Alabang, and is supported by media partners the Asian Parent Philippines, Manila For Kids, CNN Philippines, Pop Life TV, YUNEOH.COM, ClickTheCity.com, WhatsHappening.PH, WazzupPilipinas.com, MomCenter, The Parenting Emporium, Mommy Practicality, Mommy Unwired, Mommy Levy and Bazaar Whisperer.